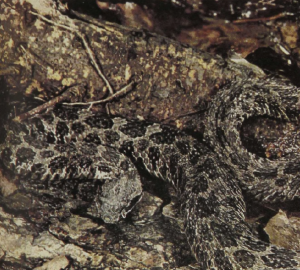 The Massasauga is one of the dwarf rattlesnakes. Unlike the true rattlesnakes, it does not have the head covered with small scales but retains the large shields also found in the Copperhead and colubrid snakes. Their rattle has been compared to the buzz of a bee. The Massasauga is a swamp snake which has a disjunct distribution through the northeastern United States, generally occurring near bogs, where it feeds on frogs, lizards, and some rodents; occasional records also refer to invertebrate food. These 2- to 3-foot rattlers produce a relatively harmless venom, and human fatalities from their bite are rare. The young are born alive, and the litter size increases with age.